Enter today by clicking the icon below. But hurry, the giveaway ends on August 31st. Winner will be announced September 1st on Colleen’s website. OK… I am going to cry! When I saw the series advertised, I wasn’t sure I would like it at all… but the experience of reading this series is one I will never forget. Yes, there is heartbreak – but that’s life. There is also tremendous joy and love and passion… and compassion! Colleen Coble has taken us along on a turbulent, tumultuous ride as we’ve followed Sarah, Amelia and Emmie along this road of life. I must admit I was thrown off a bit when the story focus switched to Emmie, but since Sarah and Amelia are so much a part of her life, we still got to follow their journey. Colleen has found the absolute perfect way to weave in the meandering stories of people whose lives seemed completely unconnected. Sarah; who started us off on this wild ride. Amelia; who helped Sarah to scrape her life back together when all hope seemed lost. Emmie; who was pulled right into the hodgepodge group of friends and family. I won’t spoil the ending for you but I will say this. Even amidst tragedy and heartbreak, Colleen finds a way to find some happiness and bring about a happy ending. Don’t miss this book. Don’t miss this SERIES! Emmie’s hope for a life with Isaac is overshadowed by a tragic loss at Fort Phil Kearny. Isaac Liddle is keen to marry Emmie, and she knows she shouldn’t hide her pregnancy from him any longer. But before she can tell him her secret, a widower friend asks the impossible of Emmie: Will she honor her promise to his dead wife by marrying him to care for the orphaned baby? With the Sioux Wars threatening outside the fort, Emmie’s solemn vow threatens her happiness from within. Will she honor a promise sure to break her heart—and Isaac’s? Or is there another way to find a home for her heart? Take a day off and head to the beach with a new giveaway from Colleen: five books (books one–five in Colleen’s A Journey of the Heart series) and a beach bag to tote your new books in! Enter today by clicking the icon below. But hurry, the giveaway ends on July 31st. Winner will be announced August 3rd on Colleen’s website. Will the promise Emmie makes to her friend mean the end to her dreams of a future with Isaac? Emmie let Isaac go to avoid telling him about her past – but Isaac is still fighting to win Emmie’s heart… and hand. And can she truly be happy, living without Isaac? Colleen will certainly keep you hooked with this series! Constant surprises. Things you never see coming! Twists and turns that make it nearly impossible to believe this was written so early in her career! The end of this series is fast approaching… I don’t know about you but it’s coming too fast for me. A Heart’s Promise – gives us a bit more of a look in Emmie, more of an exploration than a continuation of the plot… but sometimes that’s exactly what you need. The heart of a character – sometimes – gives us more of a move forward than action ever could. Getting to the heart of the matter is something Colleen Coble excels at! Emmie makes a promise to her friend that, if fulfilled, could mean the end to her dreams of a future with Isaac. Emmie Croftner let Isaac Liddle go to avoid telling him about her past. But Isaac remains determined to win Emmie’s heart and hand. Though Emmie resolves to keep her heart in check, it hurts when she sees that another woman has set her bonnet for Isaac. Then Emmie’s dear friend extracts a costly promise: if anything happens to her in childbirth, Emmie will marry her widower and raise the baby herself. And it seems Emmie may have to fulfill that promise. But can she live happily without Isaac? Melt into summer with a new giveaway from Colleen: four books (books one–four in Colleen’s A Journey of the Heart series) and a box of chocolates to pair with your new books! Enter today by clicking the icon below. But hurry, the giveaway ends on June 30th. Winner will be announced July 1st on Colleen’s website. A Heart’s Betrayal -like every other book in this series – deals with some very serious and devastating issues. It just goes to show that pioneer women really were as tough as I’ve always thought they were. It would certainly take a strong woman to deal with everything Emmie had dumped on her. Modern women could certainly take a lesson from Emmie Croftner. She had some ridiculous circumstances thrust upon her… but did she buckle under the pressure? Did she moan and complain that it wasn’t her fault and she wasn’t going to take responsibility for herself… No. She did what had to be done. And when push came to shove, she took care of herself… and her child! Emmie finds shelter in the arms of a soldier, but her secret could drive them apart. When Emmie Croftner answered the door to her late husband’s home, she discovered an awful truth: her deceased husband was a bigamist. And what’s more, the home she thought she inherited never belonged to her at all. Suddenly displaced, powerless, and ashamed, Emmie can’t stay in Wabash, Indiana. She makes a hopeful start for Fort Laramie, Wyoming, to find her friend Sarah Montgomery and a new beginning. But when she arrives, she discovers she’s pregnant—and without a husband. The new start she’d hoped for slips from her fingers. But then she meets Isaac Liddle, a handsome soldier with a kind heart. When he begins to court her, Emmie wonders whether she could ever really be his—and whether she dares to tell him she is carrying another man’s baby. Sarah risks everything to expose the betrayal threatening the man she loves—but will the risk be worth it? Find out in book three, A Heart’s Danger, of Colleen Coble’s A Journey of the Heart series. And then go Enter to win the perfect pairing giveaway: a book (book three in Colleen’s A Journey of the Heart series) and coffee to pair with your new book! Enter today by clicking HERE. But hurry, the giveaway ends on May 31st. Winner will be announced June 1st on Colleen’s website. I didn’t know tensions could get any higher than they already were in this series… but Colleen is a master at pulling her readers even deeper. So many things happen in this book, it’s hard to believe it is as short as 112 pages. I’m certain I’m not the only reader who is more than a little bugged by a certain man’s choices… actually two men if I’m being honest. One a liar and schemer – who never seems to learn his lesson and never seems to get his comeuppance. The other a good man who should be able to see through all the lies he has been fed – and should have come to his senses by now. Of course the entire ordeal is a study in the way manipulation and maneuvering can blind us to what someone really wants. And no… it’s not always easy to hear God’s voice among all of the others who are telling you what to do. I don’t know about you but I can hardly wait for book 4! A month is too long to wait for the next part of the story! Sarah is not the only one being held captive! From the first page… to the last page, Colleen will hold your fingers to the pages and your eyes to the words! The story will hold you in it’s grip and make you desperate for each new chapter. Still difficult to believe that Colleen wrote this book at the beginning of her career. But then… I haven’t read a lot of her others yet. DO NOT miss this book! And be on the lookout for the next one – coming in May! When Sarah Montgomery’s father succumbs to his long illness, Sarah is faced with a life-altering choice: submit to her brother’s will and marry the deceptive Ben Croftner . . . or escape through the dangerous American West to reclaim the heart of her beloved Rand Campbell at Fort Laramie, Wyoming. From captivity in her family’s home, Sarah makes her decision—and begins the perilous journey to Wyoming by train. But even in the company of Rand’s brother, Sarah does not receive the reception she had hoped for. The necessity of a military wife has preempted her, and Rand is already engaged to Jessica DuBois, the seductive daughter of the post commander. With her heart broken and her life in ruins, Sarah has no choice but to remain at Fort Laramie and try to win Rand back. But things will get tougher before they get easier . . . the obsessive Ben Croftner has just shown up in Wyoming. In the midst of end-of-war celebrations, Sarah discovers her betrothed was keeping a devastating secret in Colleen Coble’s A Heart’s Disguise. Will Sarah leave her dying father’s side for the only man she’s ever loved? And what plans are forming in the jealous heart of Ben Croftner? Well it certainly is a good thing the book is a serial because I COULD NOT PUT IT DOWN. From the author’s letter on page 1 to the sneak peek at book 2 – you will be hooked! And it is almost impossible to believe that this is part of a series that Colleen wrote so very long ago. DO NOT miss this book! And be on the lookout for the next one – coming in April! 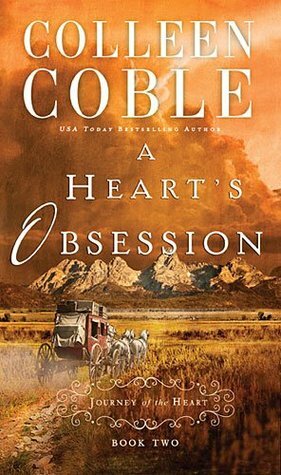 Colleen Coble’s Journey of the Heart series is certainly a MUST READ! – Tweet this! Colleen Coble’s Journey of the Heart series is sure to keep you on the edge of your seat! – Tweet this! And don’t forget to check out the special promotion from Litfuse! In the aftermath of the Civil War, a young woman searches for her lost love at the edge of the West. The Civil War has destroyed Sarah Montgomery’s marriage before it’s even begun. After Sarah receives word that her fiancé, Rand Campbell, has been killed fighting for the Union, her brothers and ailing father persuade her to pledge herself to Ben Croftner—despite her strong misgivings. But when Sarah finds out that Rand is in fact alive—and that Ben Croftner knew it—she indignantly breaks off the engagement and goes in search of Rand. But Ben Croftner does not take rejection lightly—and a single woman with a sick father makes an easy target. When Sarah is abducted by her treacherous fiancé, Rand finally comes to her aid . . . only to reveal that he has been posted at Fort Laramie, Wyoming, and intends to take her there as his wife. But could Sarah leave her dying father’s side for the love of her life? And what plans are forming in the jealous heart of Ben Croftner? Learn more and purchase a copy at the Thomas Nelson website. Colleen Coble has sold over 2 million novels worldwide. “Seagrass Pier,” the third installment in her acclaimed Hope Beach series, marks a new highpoint for emotion and complexity in Coble’s addictive brand of romantic suspense.